Reality is beginning to set in for Donald Trump. No matter how hard he tries to deny it, he’s a loser and deep down he knows it. And it can’t make him feel any better that he’s losing to a mere woman. The proof is in the desperation he’s exhibiting with his nearly complete transformation into a ranting, delusional, incoherent, conspiracy theorist. Even more telling is Trump’s descension into an abyss of relentless whining. His campaign is now wholly focused on complaints that everyone and everything is against him. The media is rigged against him. Polling places will be rigged to defeat him. Even the GOP establishment is rigging the election in Hillary Clinton’s favor for some reason. It’s a massive conspiracy aimed at destroying both Trump and America. There is something pathetic and childish about Trump’s emotional meltdown. And many others are beginning to recognize and comment on it. Responding to questions about Trump’s taped admission of sexual assault, his own wife, Melania, characterized him as a juvenile. She confessed to CNN’s Anderson Cooper that “I have two boys at home. I have my young son and I have my husband.” Her son Barron is ten years old. If Melania thinks her husband has the emotional maturity of a pre-teen, we may want to respect her opinion. Last night on The Late Show with Stephen Colbert, Bill O’Reilly offered his advice to his good friend Donald. He strongly urged him to “Stop whining.” O’Reilly said that Trump “should have a little buzzer for whenever he whines.” “Like one of those shock collars you get for your dog,” Colbert added. Good luck with that. Trump is a candidate who whines on auto-pilot. He whines about what he regards as mistreatment by the GOP. And he whines when voters reject him and belittles them for not recognizing his awesomeness. He whines about how awful America is. Then he whines about the media that aired his ranting stump speeches uninterrupted more than any other candidate. Virtually everything about Trump screams infantile. He calls his rivals liars and cheaters and pussies. He calls critics dummies and losers. Then he points fingers at others saying that they started it. He brags about his alleged (and unlikely) phallic endowment. It’s just a matter of time before he rails against his enemies as poopyheads who smell funny. He doesn’t seem to have matured past the third-grade level (literally with regard to his speeches). Now, isn’t that what you want in a president? Just imagine how effective that will be with Vladimir Putin. And ISIS will surely surrender under the threat of a sustained whine offensive. It might work best on Congress where many of Trump’s fellow Republicans have endorsed him and his tactics. So look for more whining from The Donald as Election Day nears, and especially in the days after. But be prepared for a nuclear blast of whine when he realizes that he lost. 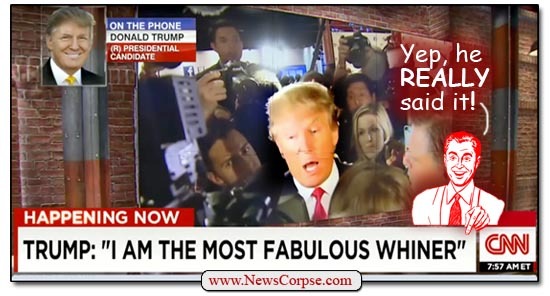 Watch Trump boast about what an awesome whiner he is. Recent Trump quote: “You can’t spell ‘awesome’ without ME!” The last time Donald Trump went through customs, he had nothing to declare except how amazing he was.